The benefit of CCTA’s decision to support my challenge started as soon as we were given the go ahead – I needed to train! I knew the tour was fully supported and that if it was too much I could ride in the mini bus, but, of course I wanted to achieve my goal and ride every km and every climb! It was such a huge motivation and really helped my recovery from the physical and emotional trauma of having cancer followed the gruelling treatment. Day 1 – We flew from East Midland Airport and arrived in Seville at lunch time. We were met by our tour hosts and joined the rest of our party. We spent the afternoon on a walking tour of the beautiful city of Seville. Day 2 – The start of our cycling challenge! We transferred out of the bustling city on the tour minibus, a 40 minute drive to the town of Carmona where our bikes awaited us in the town square. The weather was extremely hot, about 36 degrees, so we were glad to get moving. We cycled across the flat plains 55km to Palma del Rio. En route we stopped several times for lunch, snacks and water. Day 3 – After an excellent breakfast in our lovely accommodation, a converted monastery, we set out again each on our 2 wheels. We cycled along quiet picturesque lanes to our lunch stop at Almodovar del Rio where we enjoyed local pasties and ice-cream. 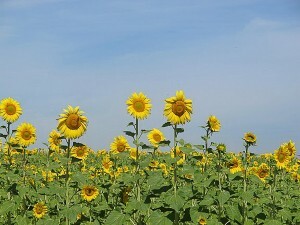 After lunch we passed through fields of sunflowers and encountered a couple of short hills before arriving in Cordoba after 63km. 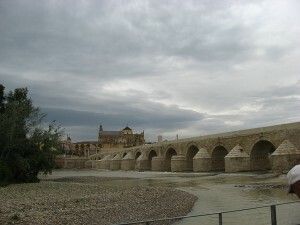 Cordoba is a beautiful town with an impressive Roman bridge. We walked into the old town for dinner in the evening. Day 4 – A rest day! We enjoyed a walking tour of the old town in the morning and spent the afternoon exploring the Feria (Fiesta). 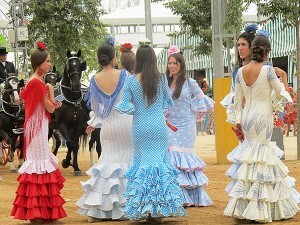 The Feria was an amazing experience – Wow! What a riot of colour and noise! Lots of women, men and children in their traditional flamenco clothes, so many colours and styles. Mums and daughters often dressed the same. Men parading their horses, horses and carriages trotting up and down. We discovered the best way to watch was to stand in one place and let it all go by! Day 5 – Back on two wheels again! A much harder day with some proper climbs. The scenery changed from the agricultural plains to rolling hills covered in olive trees. After 40km we stopped for lunch at Castro del Rio. 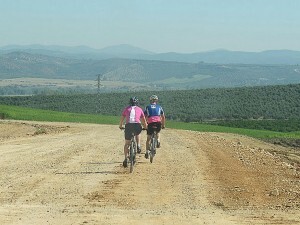 We then rode the remaining 22km through endless olive groves to the town of Baena. Day 6 – The first part of the morning was spent visiting an organic olive oil factory run by a lovely old guy named Paco. We learnt about the whole process from olive tree to bottle and were able to purchase some of the wonderful oil they produce. We set off again on 2 wheels climbing up out of the town and on for 40km to Cabra for lunch. After lunch, and another hill climb, we joined the Subbeticas Via Verde – a cycle trail, similar to the High Peak Trail, converted from the railway that used to transport olives. This provided us with a welcome flat and very picturesque ride the remaining 20km to our accommodation, a converted Hacienda (country house). Day 7 – Another 60km in the saddle! We set off again on Via Verde for just a couple of kilometres before the serious climbing started. Rolling climbs and downhills for the morning before passing through Luque and Preiga where we stopped to buy lunch for a picnic later. We climbed up out the village then along the flat for a very short while. Then our steepest climb loomed ahead! 1km at 12% – very steep and winding. Only a few of us tackled the hill – the rest had a lift in the mini bus! They clapped and cheered us on at the top. We then enjoyed a long downhill followed by another long climb, not quite as steep though, before stopping for a picnic lunch. We then rode the remaining kilometres to our next accommodation in Isnajar. Day 8 – The longest and hardest day! 65km with several long, steep climbs in the morning. After lunch we tackled a 16km hill. 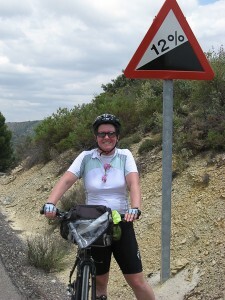 It wasn’t too steep at 8% but we thought it was never going to end in the afternoon heat! We were all pleased to arrive at our next destination Alhama de Granada. A very attractive little town with a picturesque gorge that reminded us of High Tor at home! Day 9 – The final day of cycling! Some big climbs this morning before our lunch stop in Ventas. After lunch a flat (ish!) ride on to Santa Fe where we stopped for cake and coffee before the last leg on to Granada. We all rode in convoy into Granada at rush hour which was a little hairy but we all arrived in one piece ready for a final group photo at our hotel. 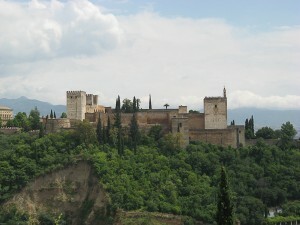 Day 10 – A morning tour of the amazing Alhambra Palace before we all went our separate ways. The whole tour was an amazing experience – and a real challenge for me! It made me feel so much better and gave me a huge sense of achievement. We saw mile after mile of stunning countryside, stayed in some wonderful accommodation and were accompanied by some lovely people! 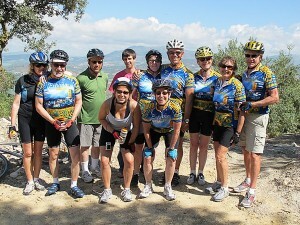 The tour organizers, Cycling Country, were fantastic! I couldn’t recommend them highly enough! A small company, passionate about cycling and passionate about the real Spain. Our closest companions on the tour were a Canadian couple, Jim and Marilyn, who are retired farmers. They were 63 and 64 respectively! They rode every km and were inspirational – and made me realise that I could go on a cycling holiday every year for the next 30 years! Thank you so much CCTA for this truly motivating experience!